Only a 2 1/2 hour drive from home, Daniel and I had a leisurely day and arrived in camp around 5 PM. Joe Schoech was already there and parked across the street. Yay. :) Unfortunately, Tamra was not with him. Daniel and I unloaded the horses and got them set up in stalls with hay and water. Unloaded the trailer and set up the table and "half bath" (a portable toilet behind a shower curtain) in the horse compartment. We like to use the entire trailer since we have a door between the small LQ and the trailer. Daniel put out the high line so we could use that as well when convenient. We ate yummy burgers, pretzels, potato salad and chocolate pudding for dinner while enjoying the evening and watching the horses. After walking the horses, we chatted with Joe and watched the International Space Station streak across the night sky. We finished the day with chores, walked the horses and went to bed. After walking the horses and the dogs, I headed out for a trail run. I was thinking about a 4 mile run and ended up choosing a trail that was right at 5 miles. I felt energized and happy running along the lake in the solitude of early morning. I got back to camp and noticed Joe had Friday (Snap's half brother; they have the same daddy) saddled and ready to ride. So much for a shower. I quickly grabbed some bites of breakfast while I changed from running clothes to riding clothes. Daniel came into camp from a walk and helped me saddle Serts. Between work and conditioning Tanna, this was my first opportunity to try out the pair of Renegade boots I have. I originally bought them for Snap, but they are too big for his front feet, so I tried them on Serts' back feet and they fit fairly well, so I had my farrier leave Serts' rear hooves bare. I easily slipped the boots onto Serts' feet and fastened them. Wondering what I was doing wrong. They were so easy to put on!!! Not at all like "easy" boots. I had 2 different sizes. A size 2 and a 2W. The 2W really is a bit too wide for Serts' hind hooves, but that was all I had, so I went with a 2W on one hind hoof and a 2 on the other. Joe and I headed to the vet check area to check out the round pen there since we had a few minutes to kill while waiting for Ron Chapman. Then we headed out on trail. By the time we got to the trailhead for the yellow/white loop, there were several horses in the group. Friday was doing fairly well handling himself in the group. Serts, of course, was the perfect horse I expect him to be. At a split in the trail, 2 riders went off an other direction and a bit later, 2 more turned back. That left Joe, Ron and me to continue on. After another few minutes, Ron turned back to mark trail and Joe and I continued on, following the yellow/white trail with our unconditioned horses. We took it easy, enjoying the day and allowing the horses to sight-see and graze. Neither of us were in a hurry to get back and our horses seemed to work well together. We took the shorter path when offered. The 50 mile trail was longer than the one for the LD distance, so we took the shorter path. Both horses did great, even though the pace was slow, both Joe and I agreed it was a good outing for the 6 year old greenie and the 23 year old. Oh, I didn't mention the Renegade boots. That's because I didn't even have to worry about them! A couple of times I glanced down to make sure they were still there or asked Joe to check his legs for blood from interference (advantage of a gray…blood shows up a mile away), but after positive answers, I stopped thinking about them. Granted, we didn't do endurance pace the entire ride, but we did trot and even canter for a bit and the boots stayed on, didn't rub AND Serts did not kick his opposite hind leg with them as he does in shoes. Still need to do a training ride "at speed," but I'm greatly encouraged. Back in camp, we stripped the horses' tack and took them over to the wash rack to spray them off. I sprayed Serts first. Surprisingly, the old man didn't want to get into the concrete wash rack. I made him, but he was not sure about it. I think the drain was freaking him out. But I got him cleaner and gave up the rack to Joe to spray Friday. I held Kit and ran interference to be sure he didn't beat up Serts. I like Kit, but Kit doesn't like much of anybody or anything, horse or human. If he was a wild horse, he'd be one of those bachelor stallions that was run off and makes raids on the main herd. Next came the fun of setting up the vet check area. Course, it really WAS fun. Putting up a tent for shade or rain protection is awesome. Gotta look into getting one of those for us. And being able to unhook and drive a TRUCK to the vet check area is still new to me. Man, I love our trailer. Somebody along the way mentioned that ICE CREAM was available at the small store in the camp ground. Score! Had to go get some ice cream. Yummmmmm. Klondike bar all the way. Ride meeting was only 30 minutes away so I hurried to finish getting my vet check things ready for Daniel to take to the vet check in the morning after the start. For the 50, blue/white checks, yellow/white stripes and pink/black polka dots. 3 loops. 50 minute holds. I don't remember the pulse, but I usually figure on 60 anyway. After the ride meeting, Daniel and I walked the horses, then the dogs, made sure the horses were comfortable in their stalls and turned in. I could not sleep. Wound up. I finally went to sleep around midnight. The alarm was set for 4:30 AM. Ride day could be a big milestone for us! The multiple alarms rang right on time to get me up at 4:30. I slid off the bed and headed out to feed the horses. Then I walked the dogs. I tried something new for breakfast. I didn't heat it. Normally, I have fake chicken patties, egg patties and fake sausage patties for breakfast on ride morning. I've tried other stuff, but this has a nice mix of protein, fat and carbs and most importantly, I'll EAT it and keep it down even with the nervous energy of a start. Anyway, I realized those are already all cooked, so no reason to fire up the cook stove. Worth a shot to see if I could stomach a cold breakfast. Seemed to work. Time saved! After breakfast, I got Tanna out of his stall and began to saddle him, noting happily that it was already getting light and I didn't have to worry about saddling in the dark or getting light set up. Tanna instantly began shaking with nervous energy. It was a bit cold, but it wasn't the cold that got him worked up because he didn't start that until I began to saddle him. Daniel helped me saddle him quickly and I put his rump rug on and threw his cooler over his saddle and shoulders. The shaking got a little less as we worked with him. At 6:30 AM, the trail opened and off we went. Loop 1 - Joe and I planned SLOW. For a couple reasons. First, trying to get Kit's brain in gear. Second, for both horses to finish! 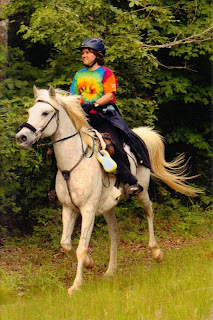 Tanna's ride was an important milestone and Kit had Biltmore in just 8 days. Tanna was perfect!! Happy to hang with Kit. Not pulling a lot. We took the lead to try to get Kit to chill out with Tanna instead of trying to win the race in the first loop. Unfortunately, these were the times to move out. But was worth the extra time to keep the horses calm. Near the end of loop Kit hit a bad rock and came up intermittently lame. We came into the vet check slowly, watching Kit closely. Loop 2 - We set a slow pace again, but this time due to rocks and taking it easy on Kit's left front especially after the easy boot flew off. Lots of long slow distance in this ride. Horses drank some and ate grass along the way. Generally doing fairly well brain-wise. I was having a great time. Not much to worry about besides a rock with Tanna's name on it and so much fun to chat with Joe. Kit seemed to be doing well and was not lame during this loop. Vet Check 2 - Back in camp, we were asked how the trail was and Joe and I both said "Rocky!" Again both horses pulsed down fast and vetted in without incident. Tanna's guts dropped to a B+, but still within normal for Tanna. All As everywhere else with a 52/52 CRI. Back at our check the horses ate some. We actually went out for our last loop fairly on time. About 11 miles to go! Loop 3 - We kept looking for the places to move out. First 3 miles were a crawl due to more rocks, but finally we found some beautiful dirt tracks to move out on. Good thing, too, as a storm was brewing. I called Daniel (at a canter) and asked him to put Joe's awning away so it wouldn't get damaged if the wind picked up. We hoped to reach camp before the worst of it hit, but the sky began to pelt us with rain. After the lightning strike nearby and the thunder literally over our heads, we decided trotting was better than cantering in case of another close call. We both would rather have a spook at a trot than a spook at a canter. From a 3.2 mph average after the first 3 miles, we covered the remaining 7.5 miles in less than an hour, urged on by the storm and aided by good footing. We had plenty of horse left for that push. I was so happy to see Nancy's truck waiting at the finish line. I was wet and cold, but happy. Tanna felt strong and sound. Nancy waved us on as we cantered across the finish line. We'd get our finish times marked on our cards at vet out. My HRM never did work all day, but I just went by Kit's HR. I figured Tanna would usually be below Kit or right there with him, so if Kit was down, Tanna would be down. We pulled tack, threw coolers on and headed for the vet. Best to get the vet out done and completions in hand before any unfortunate breeze caused a cramp that would prevent completion of this important ride. DeeDee Huff came to do Tanna's completion exam. He completed! His trot out was pretty good. She said he was a little stiff on his left rear, but not enough to prevent a completion and earned him an A- on his gait score. A- for guts (came up, yay!) and As for the rest. I kept Tanna covered and did a bit of massage and he seemed fine. We completed!!!!! This made us a Decade Team!! At least one 50 - 100 mile completion every year for 10 straight years. A goal years in the making after I learned about it. And came to pass despite obstacles through the years. So proud of my horse. He's a great partner. Joe and Kit also completed. Yay! The rain had pretty much stopped by the time we got through the completion vet check. We headed back to get the horses comfortable. Dinner was very yummy. They even had vegetarian lasagna for Daniel and me and any other vegetarian around. Our award was an LBL ball cap, which Daniel somehow absconded with. Which is cool. :) I am totally going to get a Decade jacket once they let me. And a blanket for Tanna. A cooler probably. So awesome!!! Thanks to Joe for putting up with my chatter all day long, to Dr. Ike Nelson for putting on the ride and all his wonderful volunteers, to Rebecca Nelson for feeding me lunch the next day, to Dr. Otis and Dr. DeeDee who work with us for the love of the sport and the horses, to Susan Kasemeyer for celebrating my milestone at the finish, to my husband Daniel for coming with me to the rides, supporting my endurance habit and making me go out on the loops. And to my horse, Tanna, you are my partner, my friend, my buddy. Every day with you is a gift from God and every mile with you is time well spent. Thanks for the last 10 seasons and looking forward to many more years on trail together. I wanted to come say hi after the ride meeting but you'd already vanished. Figured like most people you were tired after your fifty and ready for bed. Congrats on the decade team! Sounds like your weather was better than the Saturday 50 weather, knew we should have gone ahead and ridden rather than rested and trail ridden. Perhaps we'll see you out there again some time! Congrats on joining the ranks of the Decade Teams!! !